*We look forward to helping match your sleeping needs with the perfect natural and organic sleeping solution! If you are interested in experiencing or purchasing one of our latex mattresses, we strongly recommend you call ahead (612-374-4581) to schedule an hour long appointment with one of our mattress experts. Making an appointment will ensure you will get the one on one attention required to make this important decision. Moss Envy offers an extensive line of natural and organic bedding products including mattresses, toppers, pads, pillows, comforters, sheets, and more. What separates the bedding products we carry from most standard bedding? Why should you care? THEIR PRODUCTS = Formaldehyde soaked, chemical flame-retardants, synthetic, petroleum based fibers, dust mite welcoming, standard (pesticide/herbicide) cotton, synthetic foam, health concerns, tossing and turning, money goes to a national chain, long term impacts from chemical exposure unknown. OUR PRODUCTS = Non toxic, naturally flame resistant (wool), certified organic cotton, wool from sheep raised on organic farms, dust mite resistant/proof, natural soft latex rubber, moisture wicking, temperature regulating, sound/deep night's sleep, no exposure to toxins, your money supports a local family owned small business, made as close as the Midwest, peace of mind! Our Organic Serenity Mattress is our most popular model. Made with three 3-inch layers of natural Dunlop latex, it measures a little less than 10 inches high with its quilted casing, and provides a supremely comfortable feel. The casing is made with a strong brass zipper, so it is easy to open and close when you build your mattress. The Organic Serenity mattress can be made to feel very firm, very soft, or any range in between. 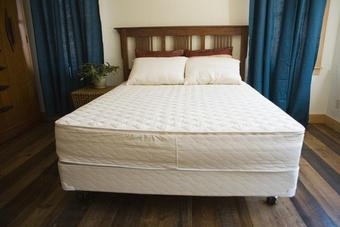 It can also accommodate two sleeping partner's different firmness needs. CLICK HERE to purchase our best selling latex mattress or to order custom-sized or split mattresses, visit or call 612-374-4581. Features: 100% Certified Organic Cotton. 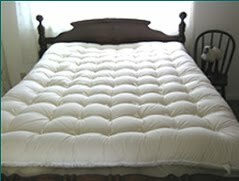 Cotton is a comfortable, durable, and natural padding choice for a mattress. Certified organic cotton is healthier for the soil, the water, the ecosystem, farm workers, you, and your family. 100% Premium Eco-Wool. Wool provides for more comfortable sleep by keeping you warm in the winter and cool in the summer. Its fibers are resilient, durable, and naturally flame resistant - meeting all federal and state flammability regulations without the use of chemical fire retardants. Eco-Wool is humanely sheared from free-grazed sheep and processed under strict controls. 100% Natural Rubber Latex. Natural rubber latex is the most breathable and resilient mattress material available. It reduces motion transfer, does not take body impressions, and is naturally mold, mildew, and dust-mite resistant. 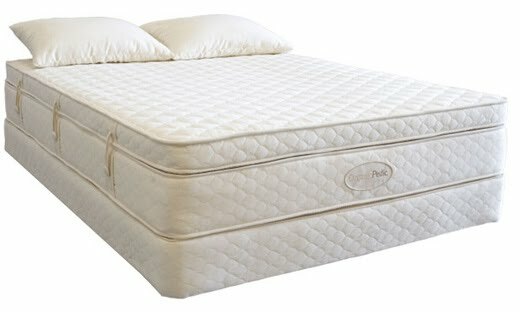 OrganicPedic mattress cores are made in the USA from sustainably harvested rubber-tree sap and manufactured using the Talalay process. Available in Innerspring and Latex styles in crib through King Sizes.